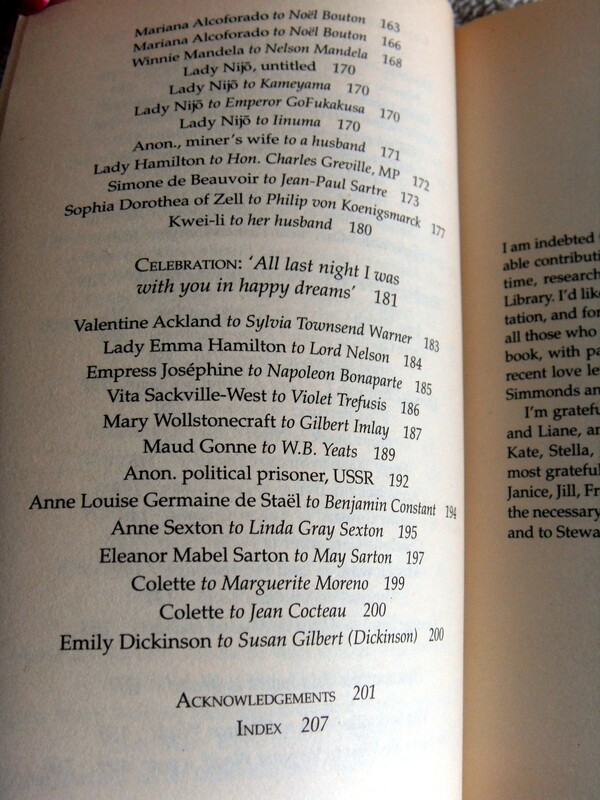 So – What exactly *is* inside the Virago Book of Love Letters? …. 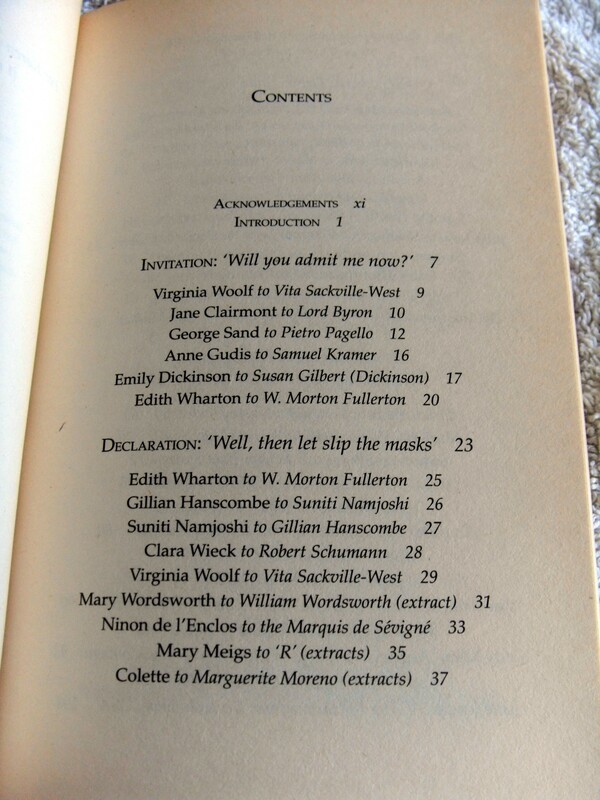 a query that has come up a couple of times since I posted that I got a copy recently – and honestly, I had no idea that Virago had published quite so many collections? Second and third pages – excuse Middle Child’s thumbnail! 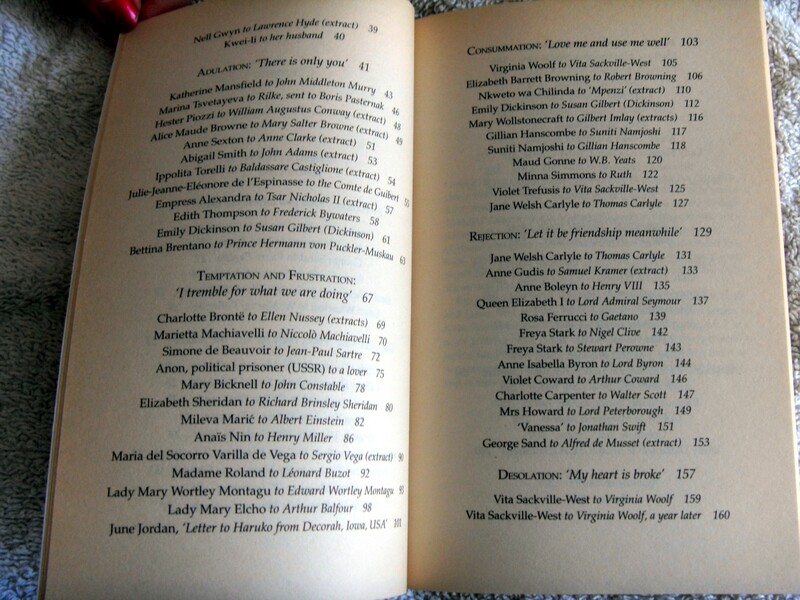 As you can see if you click to enlarge them, the letters seems to be divided into sections by themes and there are some fascinating authors there, from Mary Wollstonecraft to Colette to Emily Dickinson to Vita Sackville-West to Virginia Woolf – so, something for everybody by the looks of it! Sometimes book finds can be so serendipitous – you can stumble across something in a second-hand bookstore; a cover can catch your eye; one of your favourite publishers can bring out a new-to-you author. Nowadays, however, many of my fun finds come from recommendations from other bloggers, and this book is no exception. Furrowed Middlebrow, a wonderful blog from Scott in SFO, covers all manner of obscure women writers from the early to mid-20th century and he’s compiled a staggeringly impressive set of lists of authors to along with it. However, it was a recent review of Aird’s “A Late Phoenix” which particularly caught my eye, and I picked up a copy as soon as I could. Aird is one of those solid, reliable crime writers of the late 20th century, not perhaps that well-known (well, I confess I hadn’t heard of her) but nevertheless steadily producing quality mysteries over the years. Wikipedia says: Catherine Aird (born 20 June 1930) is the pseudonym of novelist Kinn Hamilton McIntosh. She is the author of more than twenty crime fiction novels and several collections of short stories. Her witty, literate, and deftly plotted novels straddle the “cozy” and “police procedural” genres. “A Late Phoenix” is the fourth in her Calleshire series, published in 1970, and it features her regular detectives, Sloan and Crosby. The book opens in the town of Berebury whether the new local doctor, Latimer, is taking over a practice after his predecessor of long-standing has passed away. However, he is soon being called to the building site across the road, lately the site of some failed excavations. 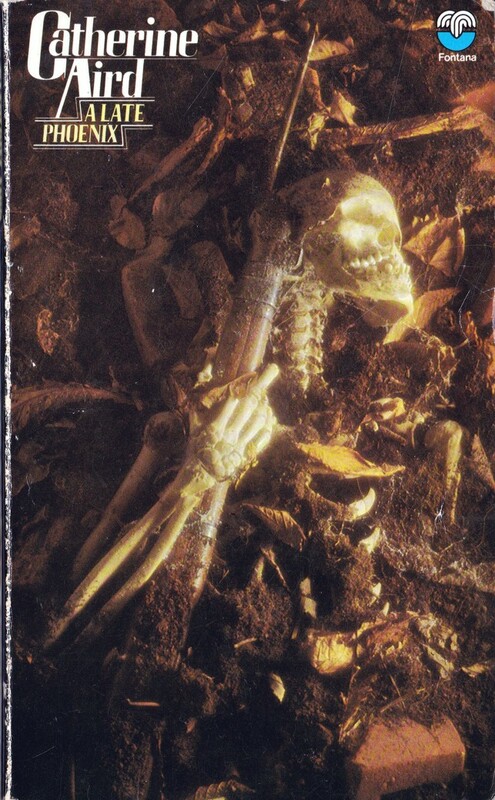 The archaeologists failed to find any remains, but the builders have succeeded – however, the skeleton they uncover turns out to be only 25 years or so old, and therefore recent enough for Inspector Sloan to be called in to investigate. The mystery itself is an excellent one: well plot, well paced, absorbing and enjoyable. I confess to guessing the victim quite early on, but that didn’t spoil my enjoyment of the book one bit – and much of this has to do with what Scott picked up when he read the book (and I’d refer you to his excellent piece here). “A Late Phoenix” has a wonderful sense of place and time because of when it was written. The Second World War *was* still a recent event, clear in people’s memories, and there were plenty of folk around who’d witnessed it. I’m old enough to have grown up in a small town in Hampshire during the late 1960s/1970s and this book gives the flavour of the time with immense accuracy. Our house was on a newish estate, built in the early 1960s, but we played in what was known as The Woods nearby. This was a piece of wasteland on the site of demolished houses (whether by bombs or not, I’m not sure, but there were plenty of ruins in the area). Part of the woods still had bomb shelters built during the War which we used to dare each other to go down (which was pretty scary as they were dark and damp), and there was very much the sense that the War was not long ago. Some areas damaged by bombing obviously sat for decades before being redeveloped (I think it was the 1980s before The Woods were finally built on) and the past and the present were still intertwined. This kind of murder mystery, where the past informs and affects the present, is one of my favourite type (Christie’s “Postern of Fate” is a book I can read again and again) and Aird does it brilliantly. Berebury is a town on the cusp of change, as were so many at the time – dragging themselves forward from a past of outside toilets and Victorian slums into the brave new world of concrete and glass. Brutalist architecture does get bad press nowadays, but I confess quite a fondness for it; possibly because it was being built as I grew up! But that’s by the by. 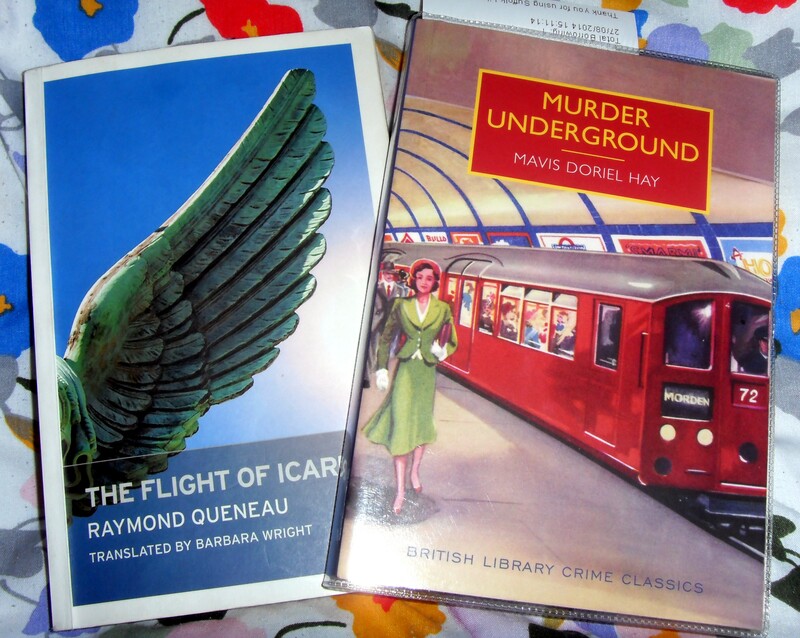 “A Late Phoenix” is an excellent, well-written and enjoyable murder mystery and on this evidence, I’d very much like to read more Catherine Aird. Thanks for pointing me in her direction, Scott! More Library Love – and a little bit of wickedness……. They are, from top to bottom, Q’s “Cambridge Lectures”, “Ten Tales Tall and True” by Alasdair Gray, “Zazie in the Metro”, “Japanese Pilgrimage” and “Japanese Inn” by Oliver Statler, “The Virago Book of Love Letters” and “Tales of Suspense” by Poe. So this is where the wickedness comes from, because I’m supposed to be ridding myself of books, not amassing more! However, in my defence several came from RISI, so it was a case of one out, one in for those. The few I bought weren’t readily available in the library and so if I want to read them I have no choice! 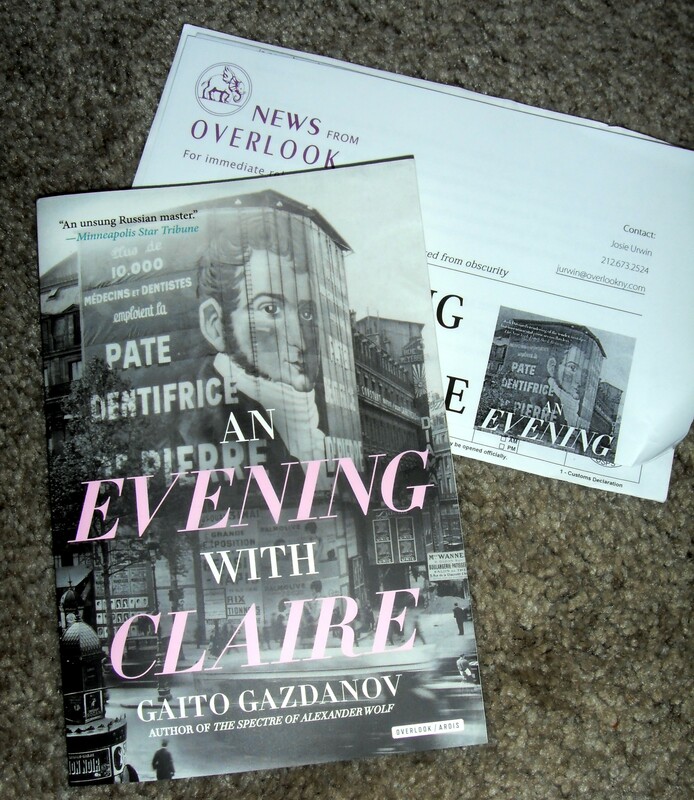 And finally today a little review copy arrived via the very wonderful Overlook Press – another Gaito Gazdanov book! Stella Benson is an author new to me, and it was the reprint of this novel by Michael Walmer that brought her to my attention. Michael kindly provided a copy for review, and I have *finally* got round to reading it – and, my goodness, I’m really wondering why a. she’s not better known and b. I’ve never read her before, because the book was stunning! A little bit about the author first. Wikipedia has quite a lengthy entry, but the bare facts are: Stella Benson (6 January 1892 – 7 December 1933) was an English feminist, novelist, poet, and travel writer. So Benson’s life was not a long one, and she died of pneumonia in Vietnam. She’d recently visited Virginia Woolf who makes reference to this in her diaries, ruing Benson’s passing and commenting on the fact that the newspaper hoardings carried the announcement of her death. 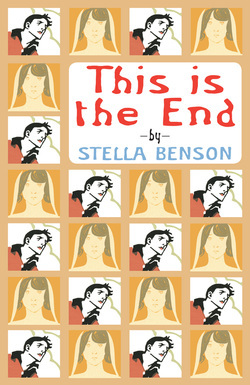 “This is the End” was Benson’s second novel, set in 1916 and published the following year, in the middle of the First World War. It tells the story of an orphaned brother and sister, Jay and Kew Martin; Kew has been away fighting and is on leave, while Jay has run away from the Family – Cousin Gustus, his alarming novelist wife Anonyma, plus Mr. Russell who has been ‘adopted’ by them. Jay has left to find her independence and do something of substance, so has become a bus conductor; the rest of the time she spends in her ‘bubble world’, a fantasy place where she has a Special Friend. The Family decide they will set off and look for her in Mr. Russell’s car; unfortunately, owing to the fantasies that Jay’s been spinning in her letters home, they have completely the wrong idea about where she is and head off into the country looking for a house on a cliff! Meanwhile, Mr. Russell runs across a beautiful bus conductor and is smitten(! ), Mrs. Russell returns from doing good works abroad, Jay continues to fantasise and the realities of war come closer and closer…. Which side will win in the fight between reality and fantasy? And there’s plenty more wit, from Mr. Russell’s conversations with his Hound (actually a Pekingese) to Cousin Gustus’s constant pessimism. However, there are more serious matters in the book, alongside the levity. For a start, there is the status of women – Jay has obviously run away from a stifling atmosphere, determined to do something of worth and gain some independence. 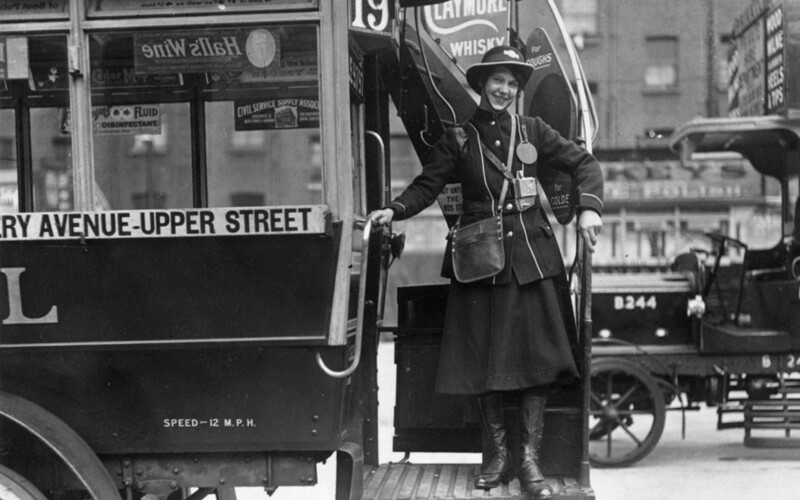 WWI was a time of course when the suffragette movement was strong and life was changing – the book reflects this, and also the position of many females within the family set up, and the expectations society and men had of them. Things come down to a kind of battle – between Jay’s fantasy world and the realities she can only avoid for so long. As the equilibrium of the Family is disturbed and events go in unexpected directions, I found myself totally caught up in the book, knowing the inevitable would happen but dreading it. I’ll say no more for fear of spoilers, except to say the end is very powerful indeed. “This is the End” is a quirky, individual book – beautifully written, with little poems in between chapters; eminently readable; and very moving indeed. On the evidence of this, Benson was a talented novelist and her early death was justifiably noted by Woolf. I’d recommend TITE to anyone who’s reading books about the First World War in this centenary year, as it’s not graphic, but has a potent message. And the fact that I’m still thinking about it several days after finishing is a tribute to Benson’s strength as a writer. It’s criminal that Stella Benson is not better know, and kudos to Michael Walmer for making her works available. The way I’m feeling about Perec at the moment, it was inevitable I would return to his work and this volume (picked up recently thanks to a gift voucher!) contains his first published works. The former was published in 1965 and the latter in 1967, and both have a common tone to them. The stories pre-date his involvement in the OuLiPo group and aren’t laden with the wordplay his later books feature. However, they’re fascinating tales and it’s easy to see why they were so popular and became cult books at the time. 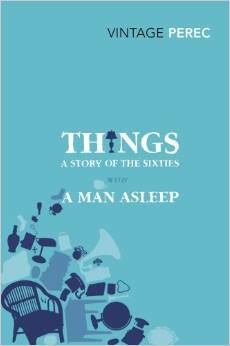 “Things” ostensibly tells the story of Jerome and Sylvia, a pair of young Parisians. We are introduced to them via their flat, in the first chapter, and initially the description sounds as if it’s a place the young couple might be happy in; simple but functional, with all the basics to live a life together. However, it soon becomes clear that this is not the case, and the focus on the objects during that introduction has been deliberate. 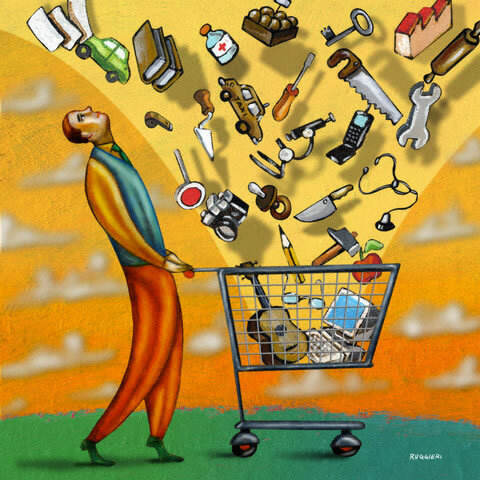 For Sylvia and Jerome are obsessed with possessions; the ones they have, the ones they want (and can’t afford at the moment) and the ones that are completely out of their reach. They dream of being rich and having all these desirable things; but they’ve dropped out of college, taken up part-time jobs as market researchers and can only manage to subsist at the level they’re at. As the story progresses, we find out more about them – they seem stuck in a kind of stasis; unable to earn the kind of funds they want with the jobs they have, but unwilling to give up their perceived independence and somewhat bohemian lifestyle to take up regular employment and earn a better wage. So they dream of objects, watch the glamorous images on the cinema screens, gaze into antique shop windows and define themselves entirely in terms of things. As their friends start to cave in and settle down, with regular jobs, the couple are thrown into turmoil. They attempt a total change by taking jobs in Tunisia but even this seems doomed to failure. Will the possessions win? Will Sylvie and Jerome ever be able to conceive of a life not run by objects? This is such an intriguing book and quite frightening in a way. Perec seems to have tapped in to the dawn of the consumer society, the time when objects, acquisition and possession became the be-all and end-all. The quality of one’s life was assessed by the style of your flat, what you wore and what you owned; the new advertising and modern standards of living, post-WWII, dazzled people to such an extent that they thought that the most important thing was to own the latest gadget – and in many ways, it’s difficult to see what’s changed in our modern, fast-turnover, mad-consumer society. The culture of consumption has gone a little crazy and the roots of it are shown here in Perec’s fascinating story. 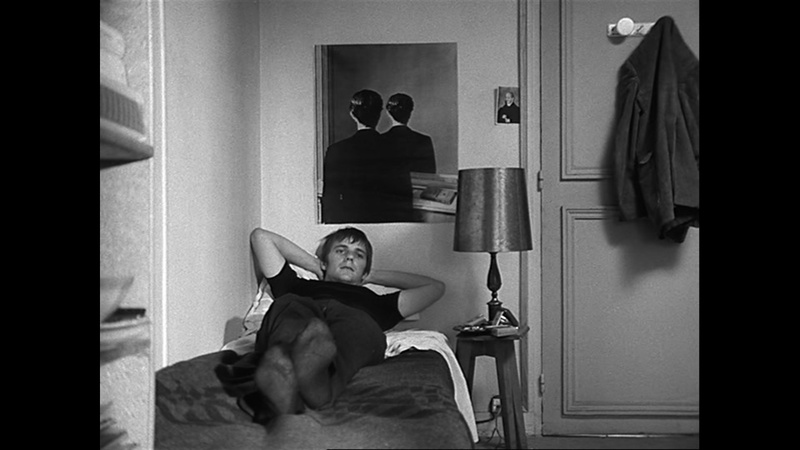 It’s an unusual construction, and in many ways helps you get inside of the man of the title; for he is a young man obviously in a state of grand ennui. On the day of his exam he simply does not get up. Missing his exam, he ignores all attempts at contact from friends and fellow students, and slips into an isolated, depressive state. His detachment is almost complete for most of the book, during which he exists on a basic level; eating, going to the cinema, reading newspapers, walking endlessly round Paris; and at one point even visiting his parents in the country. But none of this breaks through his state of indifference and it is only towards the end of the story, when his psyche reaches almost rock bottom, that there is any sign of emotion breaking through the shell. Perec apparently based this work on a depression he went through himself, and it’s quite chilling to read. The technique is striking, written almost as if a narration to a film (and indeed Perec did film the story, with the book as shortened narration over footage of an actor carrying out the actions, at a later date). It’s a remarkably effective way of getting across the depressive state of mind – and quite alarming in many ways. There is a hypnotic, almost dream-like quality to the student’s days, as he carries on his routine with his body going through the motions of life with his mind totally removed from it. Although there is autobiographical content in both of the stories, translator (and Perec’s biographer) David Bellos warns in his introduction about reading too much of this into the work. He’s right to do so, because it’s important to remember that although authors may use the stuff of their lives in their fictions, their books are just that – fictions, stories, tales. And these are as thought-provoking and fascinating as any other works of Perec I’ve read. In many ways, I wish I’d discovered his work earlier; but I’m glad at least I’ve found it now, because it means there is still more Perec for me to read! I have to confess that I don’t need much persuading to love libraries – after all, since I was very young I’ve been spending happy hours within their walls discovering all manner of wonderful books! My local one, in the nearest Big Town, is a very well stocked one – in fact, county-wide there are plenty of Persephones and the like that I’m happy to borrow and enjoy, and the Reserve Stock always has little surprises. 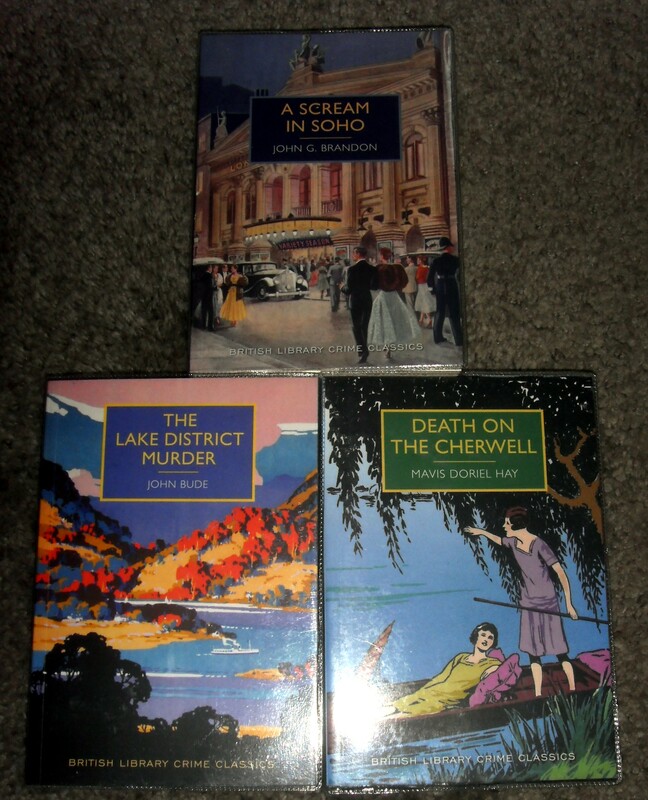 Lo and behold, a couple of weeks later the titles started appearing in the catalogue – and I instantly reserved them – and picked up the first three books they have in at the weekend! Talk about wonderful service – I am now reading brand new books which I really wanted to read courtesy of my amazing local library, with more to follow. How good is that? As you might have guessed from my reviews here, I’m something of a fan of Pushkin Press’s very beautiful books. So I couldn’t let my first visit to the sparkly new Foyles in Charing Cross Road go by without picking up one of their volumes, and this was it. I knew nothing about Aymé, but I liked the sound of the stories so there you go! 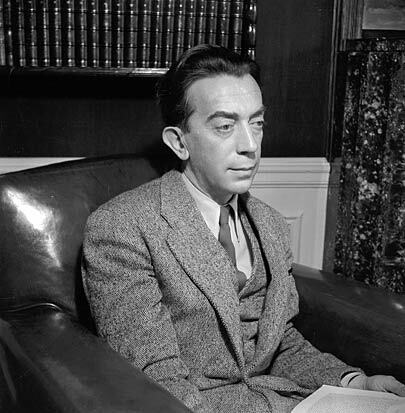 And having had a look online Wikipedia tells me: Marcel Aymé (March 29, 1902 – October 14, 1967) was a French novelist, children’s writer, humour writer and also a screenwriter and theatre playwright. The title story of this volume seems to have been his best known work and is immortalised by a sculpture in Paris. The book contains ten stories, often very different, but many distinguished by the time when they were written. Published in 1943, the works are informed by the ongoing presence of war and occupation by Germany. Several cover war and its effects, and it’s worth bearing in mind that these were written at a point when it was not possible to know how things would turn out (for example, one story mentions the 1939-1972 War, which emphasises how it must have felt to be in the centre of these events with no sign of hope). However, on to specifics. 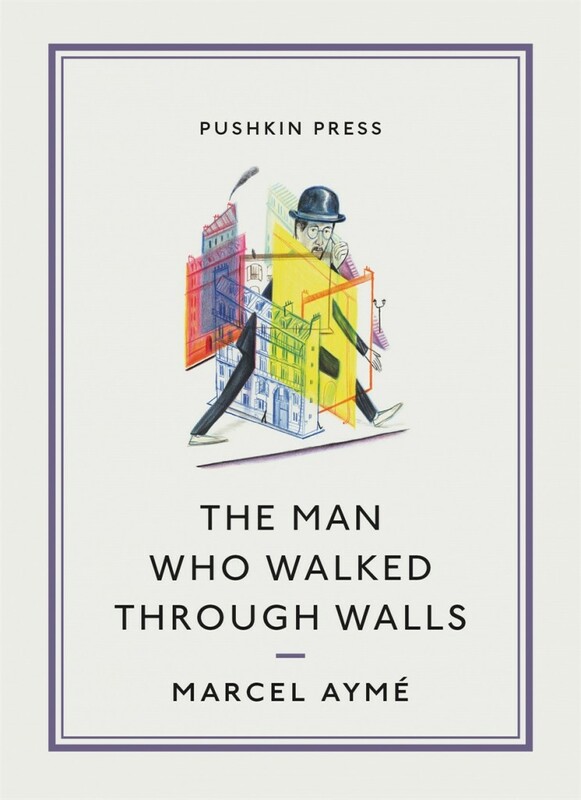 The title story is a clever, funny piece of work about an unassuming clerk, Dutillieul, who discovers that he can literally walk through walls. All goes well and he has no need to use this skill until bureaucracy gets in the way and threatens his life and his status quo. Dutillieul rebels, and has a brief time of glory – but alas, rather over-reaches himself! Strange powers are also featured in “Sabine Women”, in which the woman of the title discovers she has ubiquity and can split herself into as many duplicate women as she wants. This becomes useful when she wants loves, but becomes more sinister as they populate the world, and ends up musing in somewhat satirical fashion on the soul. Then there are a couple of strange time-shifting tales dealing with less useful members of society only being allowed to stay alive for part of the month, or a switch to summertime taking time travel to the furthest extent. There are sadder stories, too, about poverty, madness and cruelty. As Nicholas Lezard, reviewing in the Guardian, pointed out about the stories: Many were written in occupied France and conjure, obliquely, with the absurd horrors of wartime. Obliquely is correct here, as the stories are not really escapist, but look at things in a slightly skewed way as a method of coping and trying to make sense of the situation. Lezard, a huge fan, compares Aymé to Kafka and Will Self, but I was more reminded of Sigizmund Krzhizhanovsky, his strangeness, the surreality of his settings and the manipulation of space and time in his stories. This was a fascinating and thought-provoking read, full of unexpected twists, emotions and humour. Once again, I’m going to have to throw bouquets at Pushkin Press for bringing us this book – they’re turning out to be awfully reliable publishers!